An average job opening attracts around 250 resumes, out of which only the top 5 are selected for an interview, and the one lucky candidate gets the job. Hiring is challenging for both the hiring party and the candidate because it’s not just about recruitment; it’s about recruiting the right person to fit the job. Unfortunately though, the Harvard Business Review points out that as much as 80% of employee turnover is due to bad hiring decisions. This happens when hiring managers or employers refuse to follow through a proper process of identifying, recruiting, and testing candidates. There are a couple of factors that affect bad hiring decisions; inherent biases, unclear job descriptions, lack of communication between HR and departments, poor identification of skills and expertise are some of the common reasons that affect hiring. 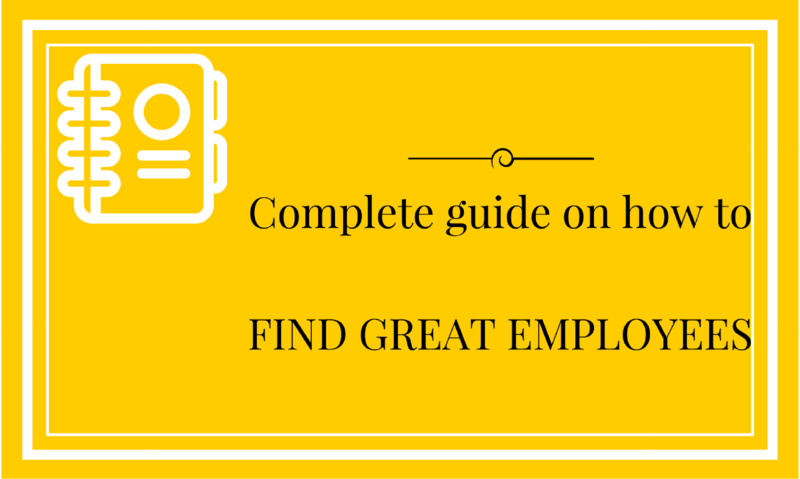 If you want to hire the right talent, here is a complete guide. In order to find the right employee, human resource experts need to start from the root. This means that employers need to know why they are hiring, who they are looking for and what would prompt them to say yes to a candidate. This information should be provided in a written form to decision makers of the hiring process. Most companies make the mistake of having only the human resource manager or the line manager to carry out the interview, while others have a whole panel. In the first instance, the interview process is just between two people which isn’t really effective since there could be high personal bias. In the second process, members can only reach a unanimous decision if they all initially agree on the 3Ws. Companies should be very clear on the job description and should be transparent with the candidate. This is the age of information and candidates are well aware of the company and the people in the company they are working for. Therefore, if companies are not clear about the role or the job description, then they may come off as boring even to the right candidate. Having a clear picture of who you want to work for you will help you identify the right person for the job. What if you had to choose between a candidate who is highly skilled with a bad attitude vs. a candidate who has amazing personality but average skills? This has forever been a topic of debate in the professional world. Some experts believe personality doesn’t matter as long as the job is done, others believe skills can be taught, and personality is more important. The classification in skills and personality actually has a lot to do with the company culture than it is with the individual. Companies that focus on developing a positive work culture highly value team players, collaborative efforts, and respect for all believe in employing people with pleasant personalities who can easily be taught the needed skills. On the other hand, companies that don’t really focus on culture will opt for skills because they wouldn’t need to waste time training people. This latter approach is the reason there is so much negativity in work cultures that result in hordes of people leaving the organization. Despite that, these companies refuse to change their culture and ultimately resort to recruiting the wrong people. The cycle is vicious and before long the company loses its respect and reputation in the market. A company cannot recruit best talents if it does not have a reliable, credible, and appealing company image. And how do you set about building your company image? Of course, by taking your social media accounts seriously. By creating a brand out of a business. Candidates these days take to social media to check on a company’s activities and the impact it has on the industry. If a candidate finds a broken website, an inactive social media account or one with terrible reviews, you could be sure of the fact that you’d be quite unsuccessful in recruiting the right candidate. Professional websites like Glassdoor and LinkedIn give a strong persona of the company’s image. If ex-employees had a terrible time in your company, they will be leaving negative reviews on Glassdoor and other professional sites. It’s best if you keep a watch over your social media profiles to negate bad reviews and show that you are a responsible company. At the end of the day, if your company has a negative culture, a shady past or an irresponsible approach, you are losing out significantly on talent. Your job ad should not be vague. Serious and professional candidates always apply to job ads that have detailed information. From your company information to your job description, to responsibilities, eligibility, and salary range – these all combine to attract the right candidate. Understand the expectations and job descriptions related to the position you’re looking for. Recently, a company attracted the wrong talent when the HR manager posted a job for a Content Developer, but they actually needed a Technical Writer. This kind of major glitch will not only harm your company image but will also waste precious time as you scan through the innumerable and irrelevant CVs. Every time there is a new vacancy, you don’t have to go search for new candidates. Make use of your resume database and pull out CVs from candidates who you loved but did not need at that point in time. Get in touch with the candidates and find out if they are still interested in being a part of your organization. When you dig into previous candidates, you save precious time, and you won’t have to go through the hassle of recruiting new talent and piling up on unnecessary data. Don’t set out to connect with people only when you have a vacancy. As an HR specialist, a recruiter or an organization, you need to have people in the recruitment department build a strong network with candidates belonging to your field of work. Again, when adding candidates, don’t just add anyone and everyone. Have a candidate profile ready and know who you are looking for. Do you want to build a network of IT managers? Of digital marketers? Do you prefer them to belong to a certain age group or have a certain amount of experience? Once you have the ideal candidate to match the workgroup of your company, add people accordingly. Share informative posts about your company, generate interest, and let these talented candidates approach you themselves for any current or future openings. Most candidates end up disappointed the moment they are done with an interview. You MUST maintain an interview process that is transparent and effective. The people conducting the interview must have polite, welcoming, and professional body language. Candidates often complain of interviewers arriving late or interviewers asking weird questions or interviewers showing the least amount of interest in hearing what the candidate has to say. While there is always immense pressure on the candidate to do well, interviewers themselves have little to no manners when it comes to interviewing candidates. Then come with questions - please. If you called in a candidate just to ask them to summarize their summary for you, then it’s truly pointless. Questions should be effective. Instead of asking vague questions like, “Tell me about yourself.” Start by saying, “So what do you do currently do and do you enjoy your work?” Be friendly. Get to know people. The more natural you are in your interview process, the easier it will be for your candidate to open up to you and share their genuine experiences without building a wall. Getting the right talent starts from inside the company. If your company doesn’t take talent seriously, then you may not be able to find the people who will help you grow. Focus on values, respect, dignity, punctuality, accountability, and other core values to make sure your current and your future employees work with you, hand in hand to build a prosperous future.